Rating: 6/5 *Very few make it this far to show my top favorites of all time. One of the things that strike me the most about this beer, just like Chocolate Rain, is that it’s intensity when it comes to chocolate is insane. This version’s ABV is much higher than the last time I tried the beer and I am sure it won’t change the rating at all. Also, this one’ is more focused bourbon to go with that awesome chocolate intensity. In fact, some of the fragrances are pretty serious. Black Tuesday introduces aromas rich banana, vanilla, bourbon, caramel, roasted coconut, oak, dark fruits like cherries raisins, sweet, dark and milk chocolate, strong hazelnut (but not as awesome as Grey Monday), pecan pie, very nice smokey sugar, like a roasted marshmallow on a graham cracker, chocolate then laced with dulce de leche caramel, some slight agave syrup, almost candi sugar, choco flan, creme brulee and a lot of sweet goodness that is hard to make out but its very appealing. The flavors boozy for sure, but very smooth a very delicious. The flavors are what gives this beer magic. Just like Dark Lord Imperial stout but more just smoother and something about it that is up there so awesome. These flavors include, sweet, dark, milk chocolate, bourbon, vanilla, oak, dulce de leche caramel, cherries, mocha, coffee, plums, raisins, burnt sugar, crème brulee, anise, chocolate cake, chocolate brownie batter, rum, chocolate smores, marshmallow, graham crackers, waffle cone, roasted coconuts, pecan pie, hazelnut cream, port wine, agave nectar, apple butter and many more complexities. Like other high ABV beers, this one should be taken with caution. It is extremely good, but sip carefully. Not to be consumed in one sitting. 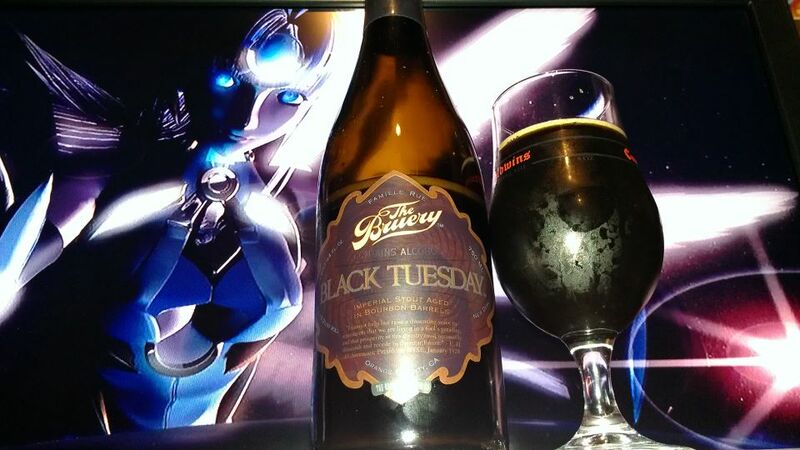 This version of Black Tuesday is on par with the Chocolate Rain high ABV (about .03%less) and some points below Grey Monday. One of my most top favorite beers along with Grey Monday, Chocolate Rain and White Chocolate. While these may be my rarest of favorites, my most common all time favorites will still be St. Bernardus 12 and Trois Pistoles. There are several ways to get Black Tuesday, although it is quite the hassle but so damn worth it. This is probably the last time I get it since it is very rare unless I get one to let sit for several years or one is given to me or served somewhere. Should definitely be on some of the craft beer bucket lists.